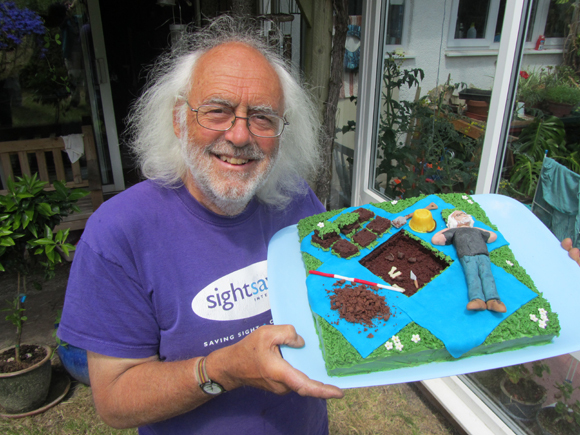 On 1 July 2011, it was Mick Aston’s 65th birthday, and his test pitting team (The Winscombe Archaeological Research Project) had a cake made for him by Sasa Donovan, representing a test pit with neatly stacked turfs, and Mick lying down on the job. Mick and Time Team have inspired me to do field walks in & around my home village of Ingoe in Northumberland (NE20 0SJ). The village is on the site of a bronze age settlement with the remains of 2 round houses and is quite close to Hadrian s Wall. I have had many happy hours walking through the fields looking for finds and have accumulated a collection of several pieces. One of my ambitions is to learn more about how to carry out proper archaeology and attend some local digs in Northumberland. All the way from Australia…How I will miss Time Team having watched it for many years.Especially though how sad at the loss of “Professor MICK”.I eel for his family and for the “other family” my friends Phil,Carenza,Stuart,John and the best artist I have ever seen.To all involved I say thank you.